55 years ago, Norman Vincent Peale wrote his best-selling book, The Power of Positive Thinking. Since then, many have touted the benefits of positive thinking and made it their life motto. Others have criticized the whole idea as a useless exercise. “Things are what they are,” they say, “and changing how you feel about something doesn’t make it any different.” Or does it? After all, positive thinking is nothing more than believing that something can be accomplished and then devoting our thoughts, ideas, talents and hard work to making it happen. Negative thinking is simply believing that something cannot or will not be done, then focusing our thoughts, abilities, and work to proving that also. Over the years, I have learned that there is no middle ground. If you are not thinking positively about an idea, a project, or even a person that you are involved with, then you are, by default, thinking negatively about it. There is no such thing as neutral thinking about something that is important to us. Another way to look at it is through the lens of mathematics. The plus or positive symbol (+) means to add to, to increase, to make favorable, or to expand. The negative symbol (-) means to take away, subtract, deny, or reduce. Let’s say we pick the number 25. This number is either positive (+25) or negative (-25). It cannot be a little of both, and it cannot be neutral. You might say, “the positive or negative sign doesn’t make much difference; it’s still 25.” But look at what happens when we combine it with another number, say 7. Combine 7 and the positive 25, and you get 32. But, combine 7 with the negative 25, and you get a negative (-18). What a difference! In math, you can predict the outcome because the formulas always work the same — you always get the identical answer. Life is not always so cut and dry. But I have learned this: when it comes to our attitude and thinking, the results are almost as clear cut as in mathematics. Those who consistently carry an attitude of positive belief will always outperform the negative thinker. But, how does it work? How does changing our thinking, our attitude, effect such a dramatic change? Why is there such POWER in positive thinking? The answer is that when we have a positive belief that something CAN be achieved, we unleash all of our creative ability and energy towards discovering solutions to make it happen. If setbacks, challenges or discouragement come our way, as they always do, our positive belief keeps us on track and encourages us to put forth maximum effort. After all, success seldom comes on the first or second try. It is those who keep going, who keep trying, who dream and create and work and believe, who eventually achieve greatness. If you are not achieving all that you would like to accomplish, I encourage you to get a “check up” from the “neck up.” In other words, check your attitude and see if, perhaps, some of your thinking needs to be examined. It makes a big difference! Numbers do not lie! All of us need to get a “check up” from the “neck up” from time to time. Thanks for your insight. I enjoyed the article- after all it’s said ‘mathematics (or arithmetic) is the key to the universe’. Food for thought: are you- ie your total self- your personality- the sum of all your individual traits- a plus or a minus? a bonus or a burden? What about your friends? How do they score? 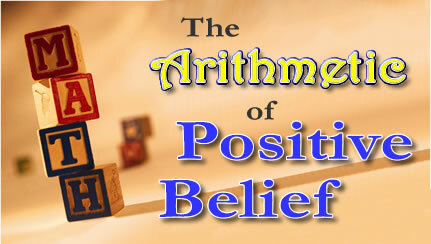 I truly found the way the author described positive thinking with arithmetic to be outstanding. The example of adding and using negatives, made the positive thinking point. And what should be added, positive affimations! Thanks for such a great article! I have found this to be true in my own life. Positive thinking is VERY powerful!! “The Power of Positive Thinking” is one of my favorite books. It just seems to put things into perspective. We determine our own future by our thoughts. Previous post: What Gets in the Way of Getting Organized?